This is what this plant is supposed to look like. Is it even possible to resist getting a plant that blooms like this? If you have a coffin-size container that you can put in a bright shade where you can keep humidity above 60 percent and temperature above 25C for most part of the year, then by all means, get one. I have one of these magnificent plants, except mine is majorly pathetic. At any one time, it manages to sustain no more than three leaves that are always brown and brittle at the tips. It melts when kept moist, then dries up when kept dry. There is a magic point of perfection that it demands, having taken millions of years to evolve its techniques for surviving its natural habitat. But whatever or wherever this magical point is, it has not revealed itself in the last two years I have had it. 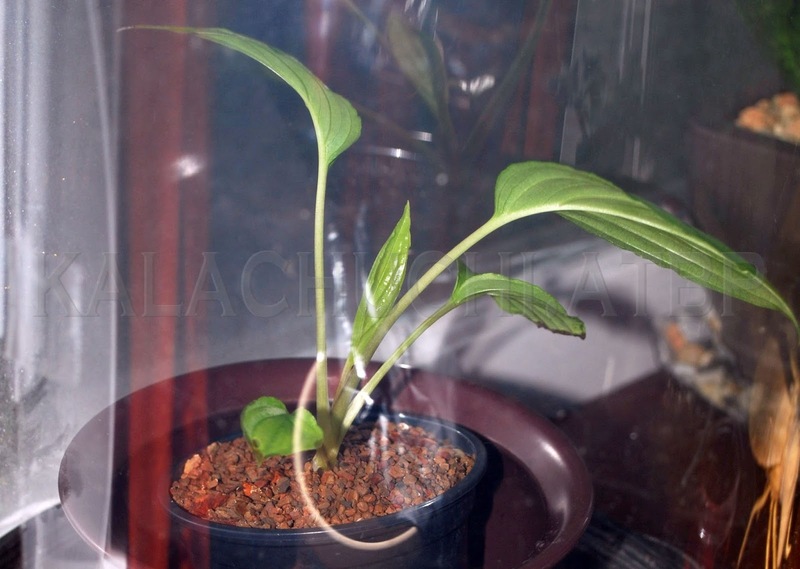 Rareflora provided a short and concise instruction for how to care for this plant and at the very bottom of the article it said, almost as an afterthought, that they would not "recommend this plant for a beginner in search of low maintenance plants." Too late for that, it's already here. Since it has not had the manners to die in a decisive fashion, it can not just be tossed out (although that's been done to it too, and it survived). Going into its second year in Zone 7, the 40th Parallel, the plant is largely unchanged in size and girth. August 2013, in a plastic enclosure. Very deep in the Tangina Zone, this plant doesn't do much. It gets water so the soil is never dry, it gets lightly fertilized once every month, in bright shade indoors, humidity never below 50 percent. It's trudging along in potting soil amended with turface and perlite. This post will not presume to instruct you on what to do with your plant. I don't even know what to do with this little nit. If I knew anyone in Florida, I'd ship this plant there. Late autumn 2014, stuck in an infinite loop. Thanks! And the plant still lives. Go figure.